The British have two very galling character flaws. We are not good self-promoters, and we love a bit self-deprecation. So, when it comes to a turntable brand like Origin Live and it’s flagship tonearm and one-from-the-top turntable, we should be all over it like a nasty rash, praising the brand and stamping our respective feet about how the plucky little British brand takes on the big guys... and wins. But we don’t do that. Instead, we go all British and get embarrassed at the success of another. Origin Live is one of those old-school engineering-based companies that were supposed to have disappeared in the 1980s. In a small factory on England’s South Coast, Mark Baker and the small team run one a cramped, swarf-filled factory in the best tradition of the great British engineer, and the results speak for themselves. Until the recent introduction of the cost-no-object Voyager, the Sovereign was the top of Origin Live’s turntable line-up. It’s also arguably the pinnacle of the ‘attainable’ decks in the line, because the best of the best Voyager S will set you back £25,000: that equates to four Sovereigns, and enough change for a tonearm and cartridge. From the Aurora and up to the Sovereign, the basic turntable layout remains the same; a belt-driven design with an outboard motor to the back right, the deck on three adjustable towers. Effectively, the further up the Origin Live product line you go, so the greater the mass of each component in the turntable. Or so a surface reading of the turntables would suggest. In fact, this is an oversimplification in the extreme. Simply looking at the intricate milling of the underside of the Sovereign’s alloy top platter highlights exactly how much more careful design and engineering goes into the better turntables. The platter is a composite of the aforementioned machined aluminium top with an acrylic lower section, and a felt mat, and this effectively decouples the record surface from the bearing. It’s a non-suspended design, although there is a significant amount of damping built into those three adjustable feet. Origin Live uses a very high tolerance bearing, but the usual slow insertion of bearing into housing is not so prevalent, because Mark Baker doesn’t think going for almost interference fit is the best way to make a bearing noiseless. The deck is supplied with a little vial of oil to lubricate that bearing, and expect a little bit of overspill when oiling the bearing, but think a couple of extra drops, not Deepwater Horizon! The motor sits in a separate, high-mass housing with a separate power supply block that sits away from the deck itself. The overall look of the turntable is extremely elegant and (gloss black acrylic aside) less ornate than many of its turntable peers. There are no spinning discs, pendulums, exoskeletons, or air pumps. There’s not even a record clamp. It’s just a damn good turntable, engineered well. 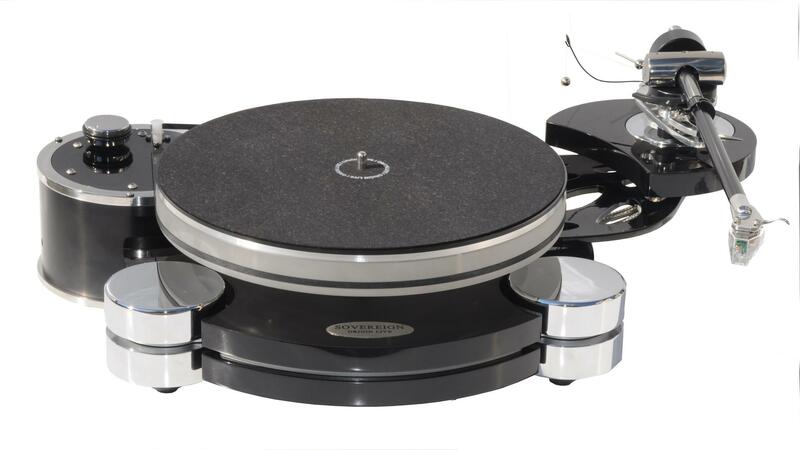 The original Sovereign was designed for a 9.5” arm, but the outriggers were redesigned and extended to accommodate a 12” arm on the skeletal armboard, which adds a £390 premium over the base £5,700 turntable price. It’s also possible to have two arms fitted when building the turntable, and this adds £490 to that base price. The armboard is pre-cut to suit Linn or original Rega arm bases, because the geometry of these arms suits the turntable itself. Other arm bases can be accommodated but, warns Origin Live, the cost of changing back to a Rega arm base (for one of its own arms) is considerable. Origin Live’s arms fit the original Rega geometry (not the new three-point Rega mounting), and that is recomputed for the 12” arm. Although Origin Live’s first arms were based around Rega components, everything today is 100% Origin Live. It’s worth re-iterating that fact periodically, because people still seem to think of the company as ‘those people who hot-rod Rega arms’.